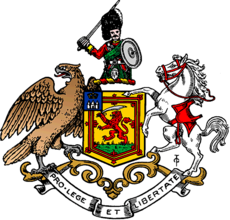 Perthshire (Scottish Gaelic: Siorrachd Pheairt) is a county in central Scotland. Officially, it is the County of Perth, and a registration county in central Scotland. By "registration" is meant marriage and land registration uses Perthshire as a county. After 1930, when it was an administrative county, governments changed the local system time and again. At the moment Perthshire is split between Clackmannanshire, Perth and Kinross and Stirling. Ordinary people stil call it Perthshire. Perthshire is known as the "big county" and has a wide variety of landscapes, from the rich agricultural land in the east, to the high mountains of the southern Highlands. This page was last changed on 6 December 2018, at 10:32.